I've always considered Lara Croft's Peruvian guide from the original Tomb Raider to be a tragic character. From the first time I saw him mauled and killed by wolves after leading Croft to Qualopec's ancient tomb, I wondered what his story was. Did he have kids waiting for him at home? Was he going to be paid well for the job that ended up killing him? What did he think about this rich British woman coming to his country to steal its treasures? We never find out. Croft coldly leaves his body in the snow along with the wolves she's dispatched, anonymous and forgotten. Though videogames often take place in exotic locations around the world, the actual residents of these places are almost never given the starring roles. They're the helpless villagers, the ruthless thugs, the background NPCs used to provide ethnic atmosphere. Lara Croft's world-hopping in the Tomb Raider series is just one example of how the majority of videogames treat countries that aren't the United States, Britain or Japan. Places like Peru are exploited for their scenery, but all exploration is superficial. Their populations are just the supporting cast. Like Croft's nameless and silent Peruvian guide, the people exist only to tell someone else's story. 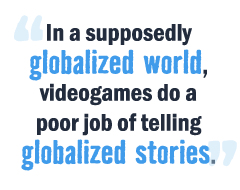 In a supposedly globalized world, videogames do a poor job of telling globalized stories. Of those that take place on Earth, most are told from the same American, British or Japanese perspectives. Videogames squander their unique power to allow players to assume the roles of other people by limiting those roles to a disappointingly shallow few. Take World War II games for example. They're overwhelmingly focused on Caucasian American and British soldiers, either completely ignoring or giving only token roles to soldiers from the rest of the world. Many critics say the World War II setting is overdone, but the real problem is that developers are not tapping into the amazing range of stories a World War II setting could provide. Why can't we play as the Filipino soldiers who fought alongside American forces at the Battle of Luzon to free their capitol city, Manila? Why can't we play as the Rhodesians (now Zimbabweans) who fought with the British military against Axis forces? It was a world war, after all. Why don't developers see the value of telling these unique stories instead of giving us the same "good ol' boy" Yankees and "stiff upper lip" Britons that were already clichÃ©s when they were first introduced?